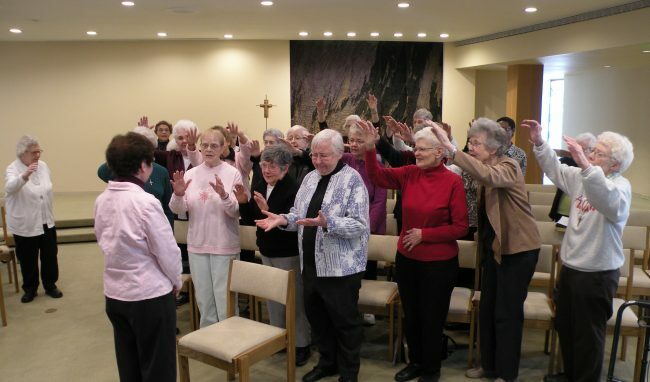 Our congregation, the Dominican Sisters ~ Grand Rapids, is an apostolic community of vowed women religious. We respond to a call to live our commitment made in baptism: to grow in the love of God. The pillars of our lives are: prayer, ministry/service, study, and common life/community. We endeavor to express in our lives the Dominican motto: to praise, to bless, and to preach. Through ministry, community, study, and prayer we share Christ’s message — redemptive love that reflects God’s desire for a just world. Our hope is to continue opening ourselves to the power and presence of the Holy Spirit — and to be a flame of truth, love, hope, and mercy. We offer our prayer in the name of Jesus who is our Way, our Truth and our Life, both now and forever. Amen. To praise, to bless, and to preach. Our desire is for our presence to nurture hope in the world. For hope is that aspect of faith which makes us certain that the world is cared for and loved by God. Hope obliges us to work toward the realization of the promises found in Jesus: freedom, peace, justice, and reconciliation. The Dominican Sisters have a passion for truth and a deep desire to transform and be transformed through the people and experiences that God brings into our lives. We willingly embrace the risk of preaching a gospel of hope, of love, mercy, and justice. Like our patron, St. Catherine of Siena, we minister so that others can be transformed in faith and community. St. Dominic taught that prayer and study are intimately linked because they lead to a deepening faith in God. Study is essential to our Dominican life and mission. It informs our ministry, enriches our common life and is integral to our prayer. Study is a blessing we offer others through our ministries including Dominican Center at Marywood, where formation and transformation experiences are open to people of all faiths. We are emboldened and informed by our relationships with Dominican women and men around the world. We join our voices with the many who have gone before us and intercede for us, models of discipleship, risking in faith, loving with passion, showing us how to live what we believe. Our solidarity helps promote human rights and sustainable development in a world where only justice will ensure security and dignity for all.